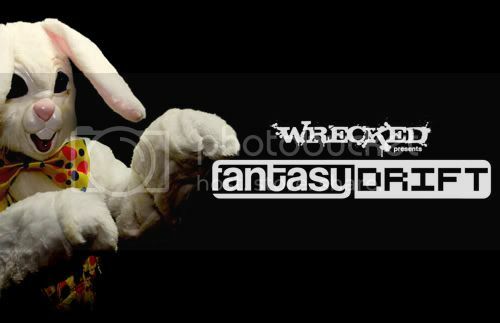 I am sure you have checked your Fantasy Drift roster today to see how you are doing in your league. Now that you have one round under your belt gear up for the 2.54 mile Road Atlanta next which will have wreck tow offs assuming your driver gets stuck in the pee gravel. We had some huge shockers in the points race showing you that anything can happen in your leagues. If you have been lazy you can still sign up and play in new public leagues that will draft from Atlanta on to level a playing field or start a new private league that will finish the rest of the season. If you need some information on how to play or register then visit the Fantasy Drift Help Page. 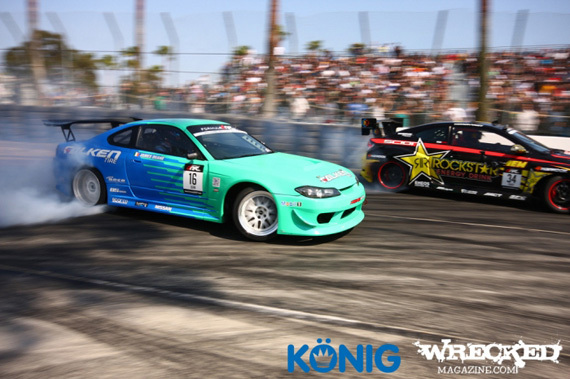 The long awaited game for Formula DRIFT has arrived on Wrecked Magazine. Once you register you become a Formula DRIFT general manager commanding a roster of four drivers. You can compete in public leagues where you can invite friends and have randomly assigned players join to fill the league. You can also run a private league which requires you to invite anyone you want to play into your game. So start a league with work, your drift buddies, or some degenerates from your favorite car forum and draft up for Long Beach! Example: This could be anything from blowing a transmission to not starting at the line. Example: For your driver to qualify into this category he must leave some parts on the track. No bumper taps will count here. Example: Note that your own driver will not count for this. For example, if you have Michael Essa and he runs Maxxis Tires you will receive points at 2009 Irwindale Speedway Round 7 since Ryan Tuerck was on the podium.